...COLD DAYS, the fourteenth book in the Harry Dresden series by Jim Butcher. I devoured half this book on the plane to France and finished it off the first week I was there. I was going to write that the Dresden Files books are a guilty pleasure of mine, but when I stop to think about that turn of phrase, I simply don't feel guilty. I like them. Jim Butcher has created a total world with a stunning variety of creatures, animals, people, places, and history that are all based on or around ideas of "magic." For those unfamiliar, Harry Dresden is a Private Investigator and modern day wizard in Chicago, and across fourteen books, we have discovered monsters, vampires, fairies, ghosts, goblins, ghouls, and other supernatural beings, in a sort of hybrid of Sam Spade and "The X-Files." Lest this sound a tad too Dungeons and Dragons/ role play for some, Butcher has a wonderful way of presenting these stories rooted in reality. He makes everything seem so utterly possible and believable... and I will tell you that I am not a D&D fan. This newest installation in the series, COLD DAYS, is just as fast, fun, entertaining, suspenseful, funny, and wildly imaginative as the thirteen that came before it. Jim Butcher is one of those writers who knows exactly how to end a chapter so that you can't wait to start the next one... which leads to many late nights ("Oh, I'll just read one more chapter, then go to bed..." and this is of course followed by, "Well, just this one more, this will be the last one..."). It is pointless for me to try to provide even a summary of the plot so I will simply say two things. 1) To those who are fans of the Dresden Files, dive right in, you'll love it. 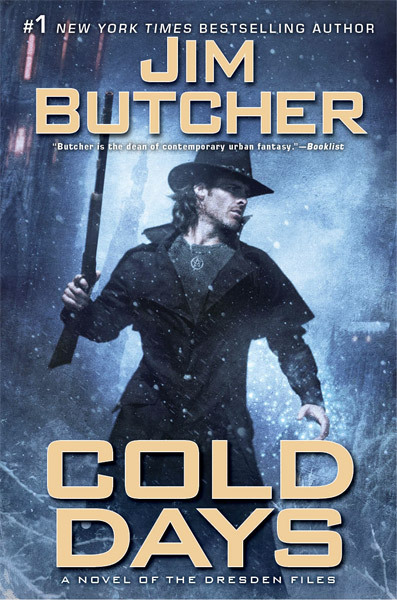 2) To those who have not read the Dresden Files, gather together the first ten or so books... they make excellent summer reading. Ready, set, go!